The ASICS Gel Fuji Attack 4 is a cushioned general purpose trail shoe. The shoe’s midsole stiffness and low-profile lugs excel on groomed trail and other smooth surfaces, but the shoe’s traction struggles on rock and anything wet. The ASICS Fuji Gel Attack 4 falls squarely into the category of cushioned shoes, but still has some differences compared to its competition—the Attack is well suited for faster running. While most shoes of this type are best suited for gentle plodding, the Attack— perhaps living up to its name—offers a bit more aggressiveness than a typical plush, cushioned trainer. This is a result of the stiffer than average midsole, low profile ride (again compared to cushioned shoes), and the heel-to-toe drop. As one might expect however, the same features that make the Attack more suited for faster running, also make it less comfortable, and in testing the ride felt somewhat harsh to runners not used to this type of platform. The outsole material also struggled to grip on bare rock and anything wet. The Attack is therefore probably best used on smoother surfaces rather than rugged, rocky trail. The Attack is perfect for runners who want a shoe for uptempo running, but can’t sacrifice cushioning and protection. It also will appeal to ASICS-brand loyalists looking for something a little different. 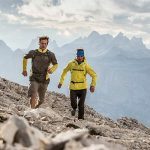 Although nominally a comfort-type trail shoe, the Attack is not quite as comfortable as most shoes in this category. It is by no means uncomfortable, and has plenty of cushioning for longer runs. However it lacks any sort of plush feel and the ride is a little stiff. The Attack turns over quite well compared to most shoes in this weight class. In fact it runs like it weighs 1-2 oz less than it actually is. 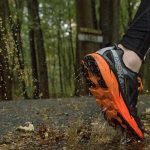 This seems to be a consequence of the midsole stiffness, which, while is certainly not in the racing flat category, generally exceeds that of most comfort-type trail shoes. The low-profile outsole lugs also stay out of the way and make the shoe a little easier to maneuver, despite what many would consider to be a large heel-to-toe drop. The Attack has a somewhat odd overall shape to it. Specifically the taper of the shoe seems to be a little less, which makes the longitudinal profile a bit more straight. Because of this characteristic, getting a secure fit through the midfoot required a bit more lace adjustment, but once that was dialed in, there were no issues. The Attack exhibits a fair degree of torsional stability due to the overall stiffness of the platform. The shorter outsole lugs also place the shoe a little closer to the ground, which reduces rotational forces during hard cornering. Stability is further enhanced by the overall lower stack height.